Customers looking for a way to control and neutralize the pH of their process and stormwater need look no further than Fortrans, a leader in solving environmental issues for a wide range of industries. The Environmental Protection Agency regulates discharge of storm water and industrial process water under the Clean Water Act. The EPA requires that the pH and total suspended solids to be controlled and monitored prior to discharge or return to municipal wastewater plants. Typically, the pH must be under 9.0 and total suspended solids must be 30 mg/l or less. Fortrans’s pH control systems allow our customers to meet both standards easily and economically. Our CO2 pH control systems for wastewater are exceptionally efficient and cost less to operate than acid-based pH control and neutralization systems. Plus, acid-based pH control systems may actually increase total suspended solids. pH-adjusted water is a an excellent source of water for truck washing, irrigation, dust control, or batching fresh concrete. Recycling will save money on cost of water or disposal. pH adjusted water may be discharged to the environment or returned to city sewer systems. You can help protect the environment and avoid regulatory issues by treating your storm water and process water with our pH neutralization and control technology. pH control systems for industrial process water management made by Fortrans use our Dif-Jet carbon dioxide non-fouling injectors in lieu of hazardous materials such as sulfuric acid and hydrochloric acid. Employees will not need protective equipment or safety training for handling hazardous acids used in other pH control methods. Reach out to Fortrans today for all of your CO2 pH control and neutralization system and concrete mixing truck cleaning needs. 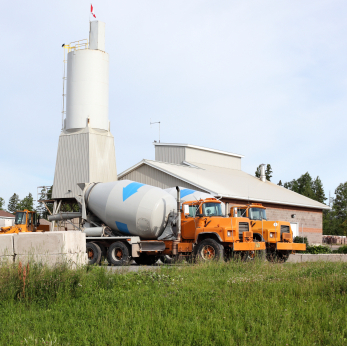 No other company can assist your concrete plant like we can! Contact our team today.